Chicken and Biscuits hot from the oven! Week 21 of the 52 Week New Recipe Challenge brings a recipe that has been in my to try file for some time. It’s from the Barefoot Contessa. By now, you’re probably seeing a trend here…I have a lot of chicken recipes posted. This is a totally made from scratch recipe. I love to make meals from scratch but I like shortcuts along the way too. If you really wanted, you could use Pillsbury refrigerated biscuits but it just won’t be the same. You’ve already committed to make the filling, go all the way and make the biscuits! You’ll be glad you did. This is delicious comfort food perfect for cooler evenings. You can make the filling and biscuits ahead to save on long preparation. Place the chicken breasts on a sheet pan and rub them with olive oil. Sprinkle generously with salt and pepper. Roast for 35 to 40 minutes or until cooked through. Set aside until cool enough to handle, then remove the meat from the bones and discard the skin. Cut the chicken into large dice. You should have 4 to 6 cups of cubed chicken. In a small saucepan, heat the chicken stock and dissolve the bouillon cubes in the stock. In a large pot or Dutch oven, melt the butter and saute the onions over medium-low heat for 10 to 15 minutes, until translucent. Add the flour and cook over low heat, stirring constantly for 2 minutes. Add the hot chicken stock to the sauce. Simmer over low heat for 1 minute more, stirring until thick. Add 2 teaspoons salt, 1/2 teaspoon pepper and the heavy cream. Add the cubed chicken, carrots, peas, onions and parsley. Mix well. Place the stew in a 10 x 13 x 2-inch baking dish. Place the baking dish on a sheet pan lined with parchment or foil. Bake for 15 minutes. Meanwhile, make the biscuits. Combine the flour, baking powder, salt and sugar in the bow of an electric mixer fitted with the paddle attachment. Add the butter and mix on low speed. Mix in the parsley. Dump the dough out on a well-floured board and, with a rolling pin, roll out to 3/8-inch thick. Cut out twelve circles with a 2 1/2 inch round cutter. Remove the stew from the oven and arrange the biscuits on top of the filling. Brush them with egg wash and return the dish to the oven. Bake for another 20 to 30 minutes, until the biscuits are brown and the stew is bubbly. Make ahead: Refrigerate the chicken stew and biscuits separately. 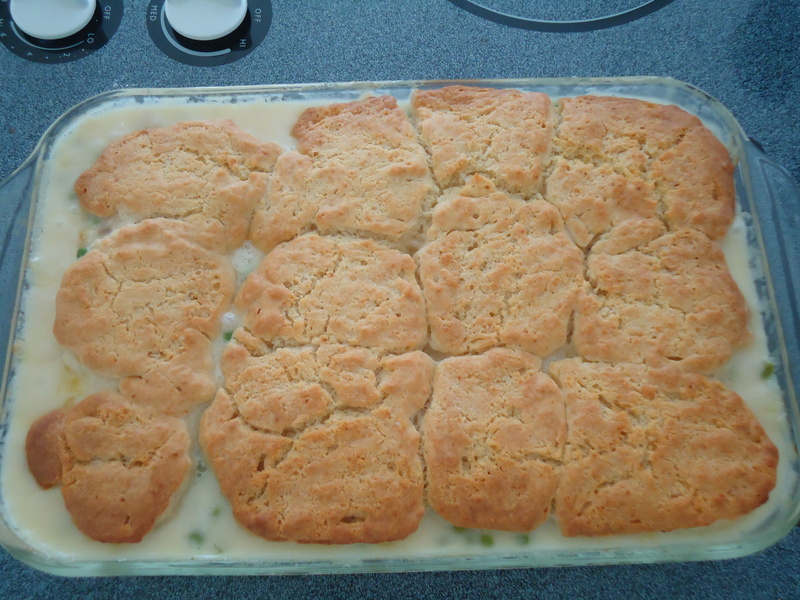 Bake the stew for 25 minutes, then place the biscuits on top and bake another 3o minutes until done. This entry was posted in 52 Week Challenge, Chicken, Comfort Food, Company Worthy, Entrees, Sunday Dinner and tagged Barefoot Contessa, biscuits, chicken, Chicken and Biscuits, chicken breasts, Chicken pot pie, chicken recipes, Comfort Food, uses for leftover chicken, vegetables. Bookmark the permalink.